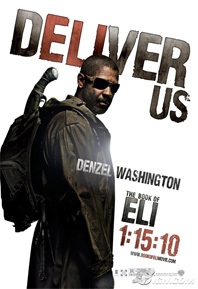 Warner Brothers has debuted three new outdoor banners for The Book of Eli (via IGN). If you live in LA, you'd see these on display at bus stops. They're not really posters, but they kind of are, I guess. 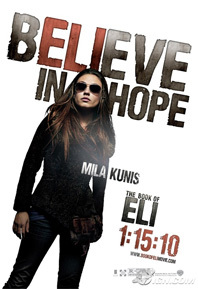 Anyway, I'm featuring them not necessarily because they look amazing or anything (though they do look cool), but rather because I've seen The Book of Eli and I wanted to sneak in my thoughts on it. I absolutely loved the movie, it was completely freakin' awesome. The visuals were stunning and the story was fantastic, too. I can't say enough good things about it, I really had a blast watching it. And with that, check out the banners below! Epic!! Fallout meets Borderlands meets Max max meets the Old Testament!!!!! lmao. what he (#1) said. The movie is pretty freakin' awesome... You guys really need to see it! "Freakin' awesome"!!! You said it Alex. From these pictures and from the trailers, I will see it. I think it has huge potential. "Freakin' awesome"!!! I will undoubtedly see it. I think it has huge potential. Sorry for those 2 comments... it was supposed to be just one. Damn this PC! Sounds like a Christian movie. Sure it will sell well but i won't be seeing it. Love the visual style. Love Oldman. Hate Denzel. #10 How the hell do you hate Denzel. He is an awesome actor. 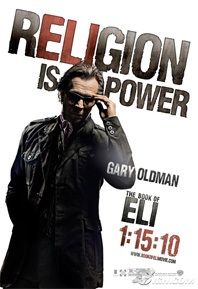 Crimson Tide, The Hurricane, Training Day, Man On Fire, and Inside Man are great films, and The Book Of Eli looks like it maybe his best effort yet. Very interesting blog, what template do you use ?